Many organisms feed on corals such as the infamous Crown of Thorns Starfish, but its unlikley you'd put animals of this caliber into your tank on purpose. More likely is the unwitting introduction of other smaller organisms like snails and nudibranchs. The most likely nudibranchs you will see will be from the genus Phestilla. A single adult can remove as much as 10 square inches (25 square centimeters) of coral tissue in one day. 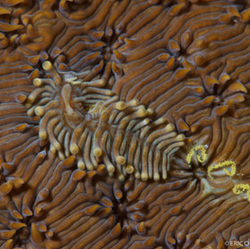 There is little initial evidence of nudibranch existence within your tank, likely poor coral polyp expansion, slight discoloration, and the presence of bare skeleton in patches. 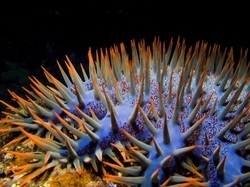 However, unless you take immediate action, the affected corals will only survive for a few days. There are many species of Phestilla and these are described in detail in the linkes below, thier full names include; Phestilla lugubris (Also described a P. sibogae), P. melanobranchia, P. minor, P. sibogae - See P. lugubris. Most species prey on Porites, however Faucci et al. 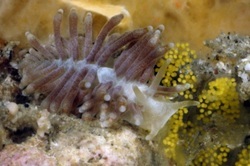 (2007) report a possible case of host-switching, where the nudibranchs feed on other corals such as Goniopora and Tubastrea spp. Many Phestilla species are known to be prolific spawners and become sexually mature very quickly (a few weeks after hatching). Furthermore, the females can lay several thousands of eggs every day (estimated to be around ~320,000 eggs in their life time) (Riddle 2012). When introducing new corals into your talk, it is good practice once the corals are settled to give the coral a shake in the water or a gentle baste with a basting syringe and see what (if anything) falls off it. This can be a good way of dislodging some key pests like nudibranchs. Turn the colony over and look carefully at the underside as this is often where nocturnal predators such as Phestilla hide. Further observations should be done over the first few days looking for signs of tissue damage or infection. Using Coral RX (6 milliliters with 4.5 litres of aquarium water) has been proposed as a potential way to eliminate these organisms from your tanks. Although the eggs appear not to be affected (Riddle 2012 - www.advancedaquarist.com). Natural predators of these nudibranchs include; the Hawaiian 'Old Lady' Wrasse called Hinalea Luahine (Thalassoma ballieui), Saddle Wrasse (Thalassoma duperrey), Threadfin Butterflyfish (Chaetodon auriga), Aerolated Xanthid Crab (Pilodius aerolatus), Xanthid crab (Phymodius monticulosus), Swimming Crabs (Thalamita spp. ), and the Mantis Shrimp (Gonodactylus falcatus) (Riddle 2012 - www.advancedaquarist.com).